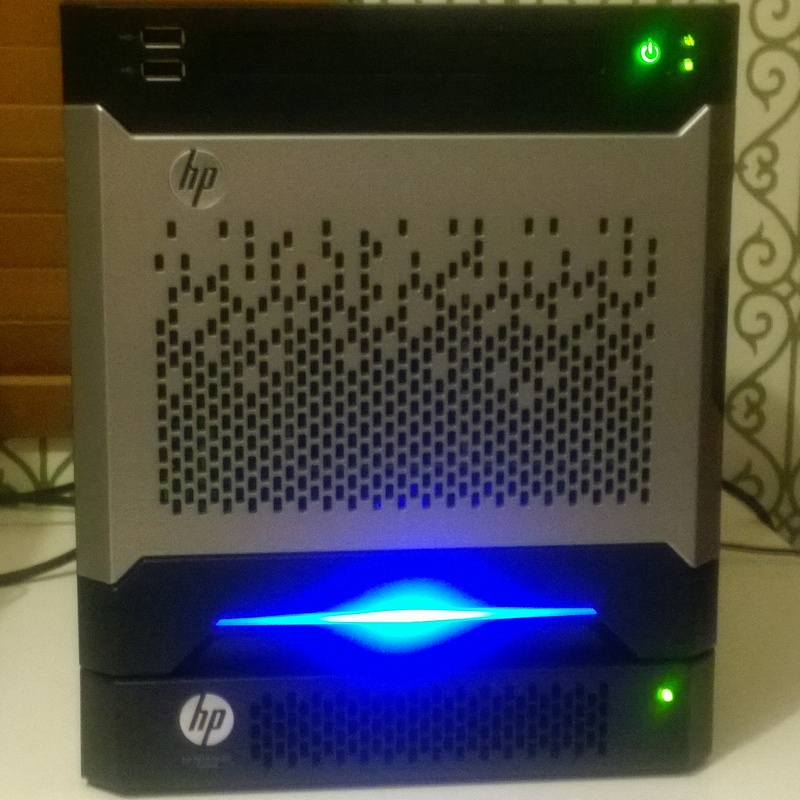 Many of you would have heard of, if not used, one of HP’s ProLiant MicroServers. They are relatively cheap cubes of servery goodness, designed to do a much better job than just a standard desktop box. HP released a few months ago the Gen8 version which has a bunch of new features. Cosmetically I think it looks a lot nicer than the older models, and it’s also really simple and smooth to take apart. It’s also closer to being a proper cube than previous models, shorter and stockier. Why get this instead of a normal desktop? It’s low powered (150w), has two NICs onboard, Hot Swap hard drive bays (holding up to four drives, supporting 0/1/10 RAID), and an ILO 4 connector. For a small business, this means you’ll have your data on redundant drives, can double your throughput via the second NIC (NIC Teaming in Windows Server 2012 is awesome and easy) and if you can’t get to your server for some reason, the iLO 4 is HP’s Management Engine that will let you both monitor the server and connect to it, as long as you’ve got power and a network cable plugged into the ILO port. 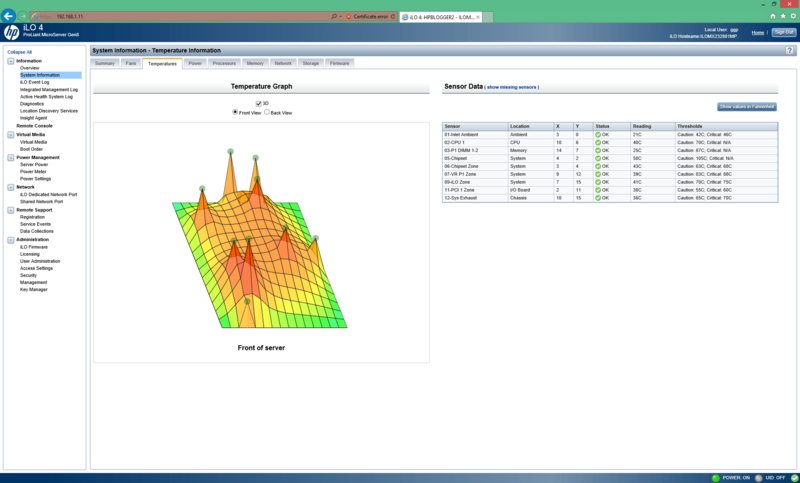 The iLO 4 interface has a lot of management options, and some interesting things like a 3d heat map! There’s even an Android and iOS App for iLO (screenshot from my Samsung Galaxy S3, using Remote Control) – just another cool little feature. Another nice features are a MicroSD slot on the motherboard – I’m still unsure if this can actually be used as a boot drive or not. Even if that’s not the case, next to the MicroSD slot is a USB port that you can plug a USB drive into for booting, seperate to your disks in RAID. Then there’s HP Intelligent Provisioning which lets you stream your Firmware updates and kick off OS installs, adding required drivers as part of the process hp.com – there’s a lot of other nice menu driven options in the Intelligent Provisioning system too (accessed by pressing F10 at startup) including diagnostic checks and modifying system settings. 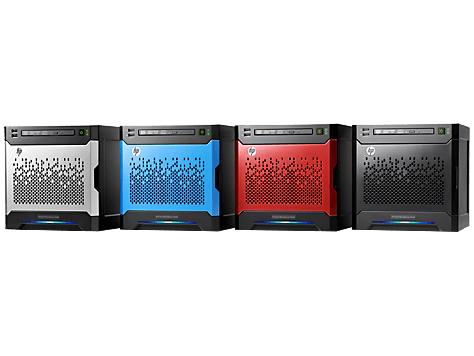 As an aside, I was speaking to a colleague about the new MicroServer as he is running two of the older models at home – overall he was very impressed between the two models and the extra features this one has – but it does come with a bigger price tag. It’s much more of a proper business server than a business class desktop. There’s a lot to cover about this kit, so in another post I’ll delve deeper into items like RAID and the optional HP PS1810-8G Gigabit switch which fits snugly below or on top the HP MicroServer hp.com. If you have any questions or anything you’d like tested, please comment below and I’ll do my best to include that in the next post. I’ll also be looking at how I’ve chosen to set it up for myself, including getting the Firmware updates working via Intelligent Provisioning, which I think is failing due to my slow 512k upload speed, being shared with other things going on. I’m rather impressed with this server – it would be even better if it had RAID 5 on board, but it’s designed really well for ease of access. Some online discussions I found have been around noise concerns, but I found the unit I have to be rather quiet.